The June issue of CQ is our second annual Take it to the Field Special, with eight different articles on the different ways you can have fun operating away from home. 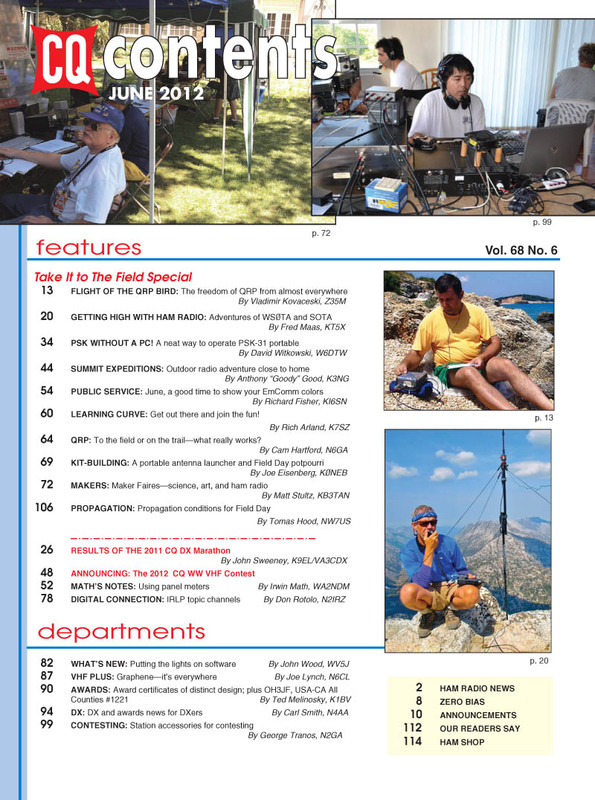 Our front cover features the most popular "take it to the field" operation of all, ARRL's annual Field Day on the fourth weekend in June. Here we have two members of the Buffalo Light House Crew setting up their Field Day station outside the historic Buffalo Light in upstate New York, where the Buffalo River meets Lake Erie. Our lead feature is "Flight of the QRP Bird … or the Freedom of QRP," by Vladimir Kovaceski, Z35M. Vlado takes his portable low-power equipment with him nearly everywhere he goes, and has operated from islands, castles, parks and even zoos! Talk about taking it to the field! Next up is Fred Maas, KT5X, a "trail runner" who runs up mountains carrying minimal gear and operates a ham station from the peaks when he gets there. His article is titled, appropriately, "Getting High With Ham Radio." For those who are a little less adventuresome but still enjoy portable operating -- and want to operate digital modes without lugging along a computer, David Witikowski, W6DTW, has one possible solution in "PSK Without a PC!" Anthony Good, K3NG, takes us back to the hills with his article, "Summit Expeditions: Outdoor Radio Adventure Close to Home." Several of our columns also follow our "Take it to the Field" theme … including Public Service about Field Day and ham response to tornadoes and flooding; "Learning Curve" with tips on how to "Get Out There and Join the Fun! "; QRP's "To the Field or On the Trail: What Really Works? ", a portable antenna launcher in Kit-Building, a look at Maker Faires in "Makers" and predicted conditions for Field Day in Propagation. 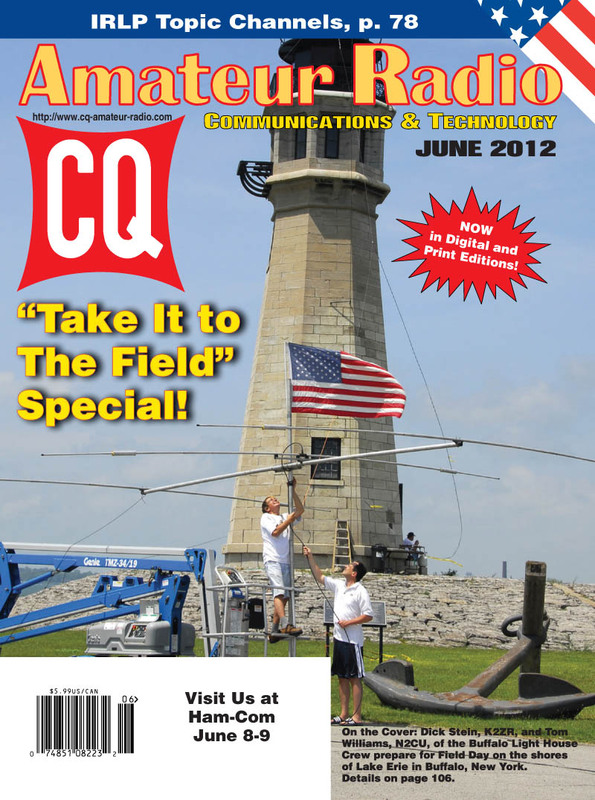 If taking it to the field is not your thing, don't worry … we've got plenty of other great stuff in this issue as well, including the results of the 2011 CQ DX Marathon - IK0OZD and K4MM were this year's big winners - and the rules for this July's CQ World Wide VHF Contest. "Math's Notes" columnist Irwin Math, WA2NDM, takes a look at using panel meters, and particularly how to use a milliammeter as a voltmeter! Digital Editor Don Rotolo, N2IRZ, explores a new concept in repeater linking -- "topic channels" on IRLP -- which can link up hams with all sorts of common interests. New Products Editor John Wood, WV5J, shines his spotlight on software this time around (with a little hardware thrown in for good measure), and "VHF-Plus" editor Joe Lynch, N6CL, continues his exploration of graphene and its potential uses in electronics. 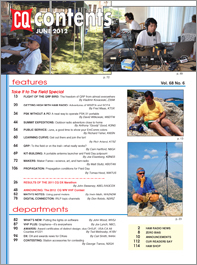 DX Editor Carl Smith, N4AA, reports on DXpeditions and the ARRL's Diamond DXCC Award; Awards Editor Ted Melinosky, K1BV, looks at "Award Certificates of Distinct Design" plus USA-CA All Counties #1221 - OH3JF; and Contesting Editor George Tranos, N2GA, asks some successful contesters about their most important station accessories. That's a brief look at what's coming up in the June issue of CQ magazine -- in print and online -- which should be on newsstands and in subscribers' mailboxes by the beginning of the month. 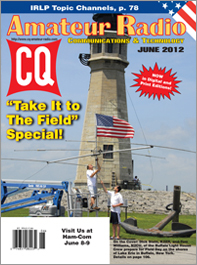 For information on becoming a CQ subscriber - to either our print or digital edition - click here. Zero Bias - "The (AC) Power of Motivation"